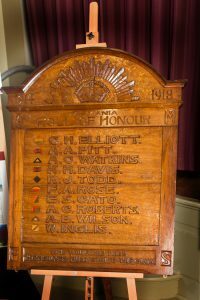 Honour roll carved 1919, AMP Ltd . Who was Nellie Payne? As the AMP Society no longer have offices in Hobart, this Honour Roll is now housed at RSL headquarters in New Town. ADDRESS BY SIR ELLIOTT LEWIS. The ten names inscribed are -C.H. Elliott, A A Pitt, A C Watkins, KH , R J Todd, FA Rose, ES Cato, A O C Roberts, A B Wilson, and W Inglis. Sir Elliott Lewis, chairman of the local board of directors of the society, was accompanied by his co-directors, Messrs E H Pearce (deputy chair man) R F Crosby and J H G Murdoch, and there were present members of the society’s , Lieut Colonel Elliott and Mrs Elliott and relatives and friends of the men whose names appeared on the roll.